Jesus and his disciples were on their way to Jerusalem for the Passover Feast. Jesus told two of his disciples to go into the village on the way and there they would find a young donkey that had never been ridden. They were to bring it to Jesus. If anyone questioned them, they were to say "The Lord needs it and will send it back soon." Years before, the prophet had said, "See your king comes to you, gentle and riding on a donkey, on a colt". They brought the donkey to Jesus and put their cloaks (coats) over it and he sat on it. As they rode along, the people began to throw their cloaks in the path ahead of them. Some cut branches and placed them in the path. They were making a way for the entrance of their king. 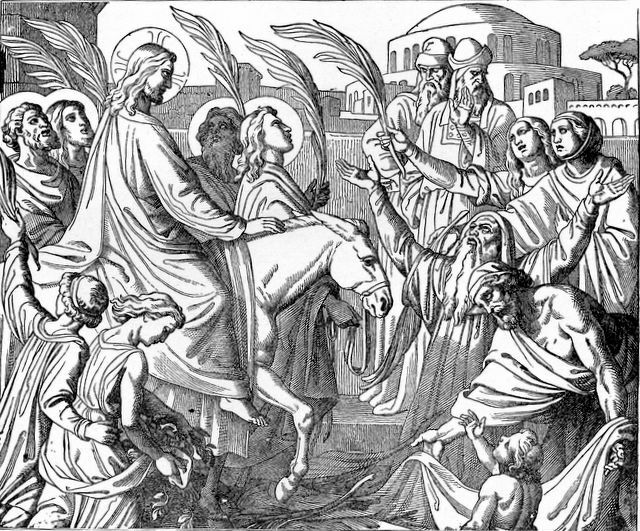 They shouted, "Hosanna to the Son of David! Blessed is he who comes in the name of the Lord. Hosanna in the highest." 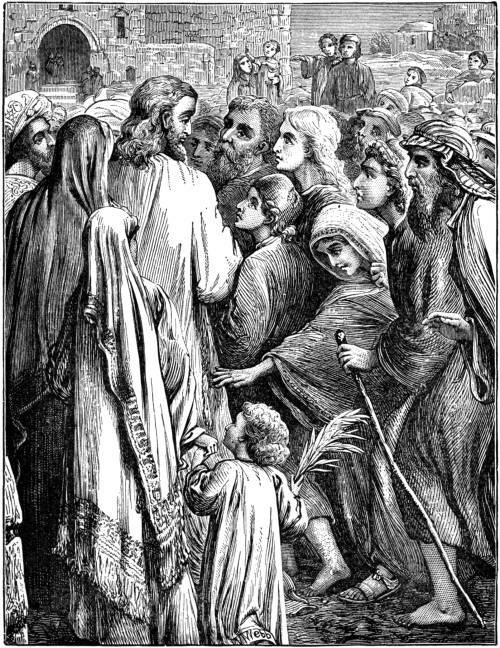 The next day, he entered the temple in Jerusalem. When he entered the temple area, he saw people buying and selling cattle, sheep and doves for sacrifices. 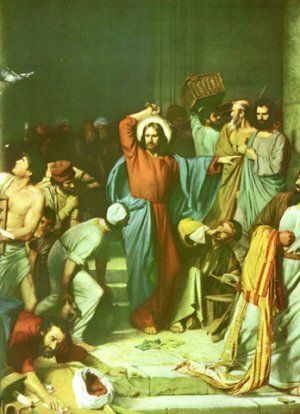 He became very angry and made a whip of cords and made them leave. He turned over the tables of money and drove the animals out of the area. He said, "Get these out of here! How dare you turn my Father's house into a market!" The children were again shouting, "Hosanna to the Son of David". The temple leaders asked him if he heard what the children were saying. "Yes," he said, "From the lips of children and infants you have ordained praise." Jesus loves to hear the praise of children. Jesus entered Jerusalem riding on a donkey. 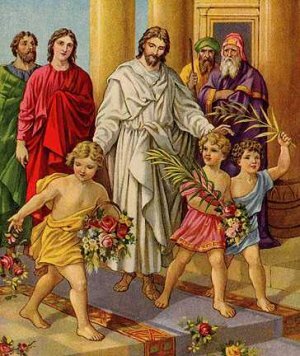 The children sang songs of praise and gave Him honor. How can you honor Jesus today? You also can sing songs of praise to Him. You can honor your parents and in so doing you will honor Jesus. When you don't show respect, you cause others to speak badly of you and of your parents and bring reproach upon them. What does it mean to honor your parents? When you are a child, it means to obey them and respect their wishes. When you become an adult, you honor your parents when you care for them and help to meet their needs as they grow older. It all starts with the right attitude when you are a child. English Bible Activities Select stories #220 and 221 in the list for activities to accompany this Bible story. Spanish Bible Activities Select stories #220 and 221 in the list for activities to accompany this Bible story. 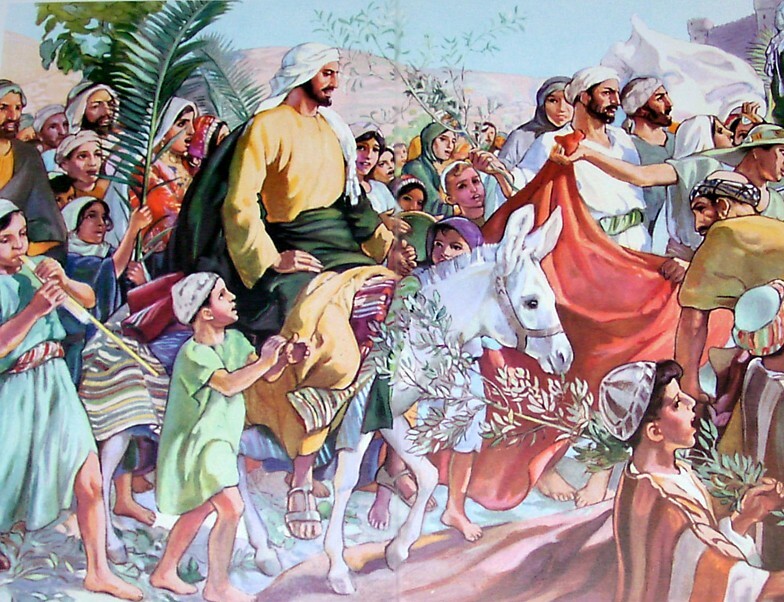 Press "Go" to search for books about The Triumphal Entry. Thanks to your great set up, I have been able to do most of my work for VBS for our small Church. It is the best place. I have been able to get more than any one web site. Thank you for your website. It has helped me find the Bible story pictures I need for our Wednesday night program. Excellent lesson for kids and everyone. Good activities for lesson reinforcement. I like the crossword puzzles. This page displayed 105,989 times.